Wine, Food, Beer, Music, Free Rides, Hourly prize draws and Friends – A perfect combination! 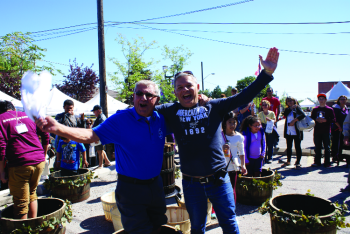 On Saturday, September 13, the Emery Village BIA is hosting its second annual celebration – the Emery Village BIA Wine Festival. 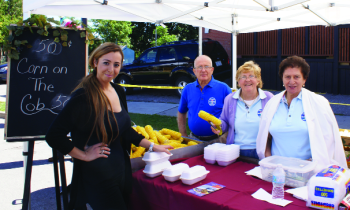 The North Islington Seniors will do their magic and once again serve up some fresh sweet corn for all to enjoy. The streets open up and residents descend upon Plunkett and Satterly Roads – each closed off for festival-goers on Saturday. There is new entertainment this year all day long. You will enjoy music from the traditional Italian to spicy Spanish. And don’t forget the famous Spider Jones dishing out some R&B along with the very soulful –Blu Soul. There is something here for everyone! Colio Estate Wines, along with a generous donation from the BIA, will offer samples of some of the best wines available in Ontario. Jim Clark, President of Colio Estate Wines said crowds will taste a wide range of product from traditional red and whites to our award winning Sangria. New to the festival this year is a beer tent by Nicklebrook . John and Peter Romano, owners of Better Bitters Brewing Company (since 1992), built the Nickel Brook Micro Brewery from the ground up. Since 2005, Nickel Brook has quickly developed a reputation for having a lively and enticing line up of beers. It is in their business to offer their customers an unrivaled experience designed to surpass their expectations. Yum Yum ! Superior Event Group will supply the Kids Zone, on the corners of Islington and Satterly. As a first there are two Kids Zones this year. Look for the kids to be squealing on the Berry Go Round, Lady Bugs Ride, Pedal Karts with Track and Wacky Dual Slide Bouncy Castle – Oh, and ALL the RIDES are free. “Humber Summit” in Emery Village is now “party central” — an area focus — with preparations for the coming-out party for the Satterly Rd. and Plunkett in high gear.